I don’t get very excited about reverbs as much as I used to but if anyone can breathe new life into reverb, it is FabFilter. 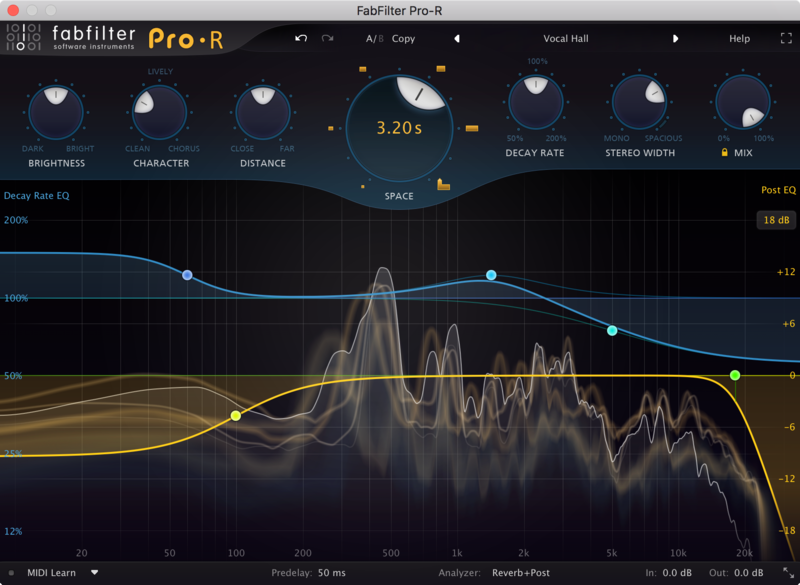 Pro-R is Fabfilter’s algorithmic reverb that claims to do everything from natural to other-worldly. AMSTERDAM, The Netherlands, November 15, 2016. FabFilter is proud to announce availability of FabFilter Pro-R, a high-end algorithmic reverb plug-in with musical controls and a very natural sound. Its advanced algorithms have been carefully designed to blend well with the source and fit easily into a mix. FabFilter Pro-R is bursting with innovations like the intuitive Space control that seamlessly switches between dozens of room models with automatic decay time adjustment, and the industry-first Decay Rate EQ concept that introduces free adjustment of the decay time over the frequency spectrum. Together with the built-in Post EQ and an abundance of high-quality factory presets, FabFilter Pro-R delivers pristine sound quality and maximum ease of use.